At a special press conference, the Russian president breaks his silence for the first time since the crisis began. 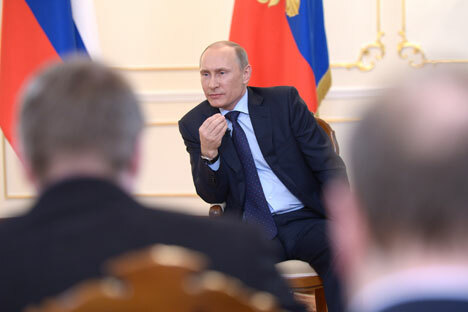 Vladimir Putin gave a press conference, during which he offered the Russian perspective on the situation in neighbouring Ukraine and urged politicians in Kiev to take steps to restrain radical forces and restore national unity. “There can be only one assessment: an armed seizure of power. No one is disputing this. The question for me is, why was this done? Why was it necessary to plunge the country into the chaos that it is in now? There is no answer. They wanted to show their strength—in my opinion, this was an unwise move. Southern and southeastern Ukraine have been stirred up by these actions. “The use of the military is an extreme scenario. But we have received a direct appeal from the legitimate Ukrainian president, Yanukovich, for military assistance to defend Ukraine’s citizens. We are seeing carousing by neo-Nazis, nationalists and anti-Semites in some parts of Ukraine, including Kiev. Sending in forces is an extreme measure. “There has been neither a single military clash nor a single shot. All we did was reinforce the security of our facilities. We do not intend to intervene, but we think that all of Ukraine’s citizens must be offered equal rights to participate in the life of the country and to define this country’s future. These were local self-defense forces [i.e., the soldiers in Crimea]. We did not take part in their preparation. “In theory, we would be willing to consider measures to provide other tranches, but our Western partners are asking us not to do this. They are making requests regarding cooperation within the framework of the IMF in order to stimulate the Ukrainian government to carry out reforms to rehabilitate the economy. The government is currently examining different options. “We are being accused of acting illegitimately, but we should recall the United States’ actions in Iraq and Libya, where they acted either without any sanctions or having distorted them. Based on a report by RIA Novosti.